Martin and I are in Texas, visiting my parents. Previous visits here brought Martin unmitigated happiness, as he basked in Grandma and Grandpa’s attention and enjoyed school-free all-day playtime. This trip has been different. Almost as soon as we arrived he became moody and crabby—and asked to go home. After a few days I realized that Martin has matured, socially. He misses his little friends and interacting with other kids. I decided to take him to a toddler playgroup sponsored by the church I attend when in Texas. I didn’t know any of the families attending, so I faced the usual question: What explanation do I give? I’ve admitted already that I hide Martin’s autism, constantly. My blog is anonymous, and Adrian and I choose not to share Martin’s condition. The playgroup presented more challenge than usual. We were there specifically to spend time with other toddlers, all of whom were neurotypical (at least as far as I could tell). We were strangers asking to be welcomed. And the differences were bound to show. No hiding, no blaming Martin’s quirks on tiredness, or on speaking Spanish better than English, or on being shy. And no reference to the A-word. I said he has “some speech and language delays” and left it at that. Martin’s conduct at the playgroup, along with my choice of introductions, got me pondering a conversation I had weeks ago with his Track Two doctor. The topic was whether the A-word still applies to Martin. Autism, as I understand the condition, is defined by symptoms, not by causes. If a person displays enough of the symptoms, to enough of an extent, then s/he is classified as on the spectrum. If Martin no longer displays many symptoms, and the ones still present (like repeating words and questions) are infrequent, does he still have autism? Was my statement—“some speech and language delays”—accurate, even if we are still battling the underlying causes of autism? I don’t know the answer, of course. But I’m over the moon just to be asking the question. When Martin launches a crying fit—usually because he doesn’t want to do whatever we’re about to do, like eat dinner, or put on clothes—I kneel, hold his hands in my left hand, raise my right index finger a few inches from his face, assume a stern expression, and look directly into his eyes, even if he avoids mine. The desired effect of this is that, after a few seconds, Martin will say, “No crying,” sniffle, and regain control. The method succeeds in about 60% of tantrums. If sternly raising my finger fails, then I direct Martin to the “crying spot.” At home, the crying spot is one end of our sofa. Anywhere else, the crying spot is wherever I indicate. (“That bench is a crying spot. Do you need to sit in the crying spot?”) Either the threat of the crying stop suffices to stanch the tears, or Martin sits (remarkably, he stays put) until he’s calmed down. This method has tamed Martin’s tantrums. So yay! Yay for me and Martin. Then there is discipline, which is a decided boo! Boo for me and Martin. I have yet to find an effective way to discipline Martin. I use time-outs, of course, and they accomplish nada. (Of course?) Martin perches on the stair landing, our designated time-out spot, until the kitchen timer sounds, then leaps up, yells “Sorry!”, and goes about his business—his business being, often, to repeat whatever behavior just got him in time-out. Of particular frustration is that Martin still lacks strong ability to read faces and emotions. I have trouble conveying genuine anger to him. On our latest trip to Chicago, Martin and I pulled into a Whole Foods Market to buy food supplies. (We stay in a hotel “suite,” which offers a kitchenette where I prepare simple meals.) Martin, who was tired, rode in the cart. He asked to hold the ghee I selected. Martin needed a few reminders on that point. Nevertheless, we finished shopping and paid without incident. Back at the hotel, I unloaded the groceries onto the counter and informed Martin that we would head to his doctor’s as soon as I went potty. I was doing just that when I heard a smash from the kitchenette. Martin materialized in the bathroom doorway, smiling. “It fell,” he said. —as I seized Martin under the arms and yanked his stocking feet from a pile of ghee-slicked glass shards. The evidence was indisputable: Martin had taken the ghee jar from the center of the counter and dropped it onto the tile floor. At the least. More likely still, Martin had thrown the jar. I was furious. I marched Martin directly to the sofa for a time out. He lolled merrily there whilst I tried to use paper towels gather glass and ghee, and then he accompanied me to the front desk, where I sheepishly requested that our freshly cleaned kitchenette be re-cleaned. He evinced no remorse. To the contrary, notwithstanding my scolding, he appeared downright gleeful. Readers, if you have suggestions, on how I might get Maritn to understand when he’s in trouble—please, send them. For my part, I’ll try to keep perspective and focus on Martin’s testing limits, which I understand is a positive and natural developmental stage (unlike, say, misreading emotions). The next day I recounted the ghee incident to a good friend, also mother to a toddler. Not a very happy post yesterday, “Bad Day. My Bad.” Sorry about that. Indulge me to add that it’s Sunday again, and today has not been much better than what I described in that post, although I’m pleased to report that at least I managed the behaviors more skillfully. I’m noticing a weekend pattern—bad night Friday, drowsy yet agreeable Saturday, killer Sunday—that may be linked to a new therapy we’re doing. More on that later. This evening, let’s celebrate. Wednesday this week I strolled a sidewalk with Martin and his friend, en route to a neighborhood playground. Martin’s friend, despite some behavioral issues, is verbally much more advanced than Martin. He and I were engaged in conversation, which momentarily diverted my attention from Martin. Let’s break that down. Martin observed his surroundings, was aware enough to spot a child, decided to engage that child, and spoke in a clear and appropriate manner. He even paused a bit and waited for a response. Another first, this whole activity package. Only this one time have I seen Martin, unprompted, initiate such interaction with a stranger. Perhaps he won’t do so again for months to come. But he will do so again sometime. And then again. And again and again. And then another novelty will become commonplace, and we’ll be one step closer to typicality. And the girl stopped on the bicycle? Alas, she did not provide the response Martin had sought. She was older, perhaps seven. She turned up her nose and pedaled away, ignoring Martin’s overture. I suppose we can’t expect the whole world to join us on our recovery journey. 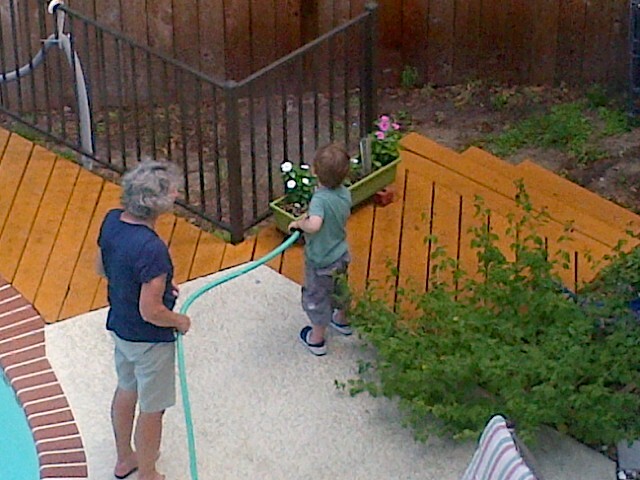 Sorry for the poor picture quality; I couldn’t resist this mobile-phone photo of Martin “helping” his grandmother with the gardening. Autism is not a “blessing.” My son’s illness did not “happen for a reason.” I just don’t see the world that way. But I do have the wherewithal to extract the positives where I can find them. I could not have written that last post if I weren’t paying attention. Paying attention to everything, that is. Noticing Martin’s ups. Trying not to dwell on his downs. Celebrating imitation and inference-drawing as if he’d graduated Harvard. Recovering from autism is like navigating childhood in slow motion. Martin achieves only gradually skills that neurotypical kids acquire in a flash and as a matter of course. My only child is on the spectrum, so I don’t know this for sure, but—I suspect that parents of neurotypicals may overlook tiny changes when they occur. They probably don’t keep calendars to mark when their children first pucker and blow bubbles. Adrian and I see every momentum shift. And years from now, when Martin is a surly teenager who rejects us in favor of his friends, we’ll be able to celebrate the event as our own special victory. How many parents can say that? We’re in one of those “something is different” times, when Martin seems to be achieving some new skill every day. I love the “something is different” times. Blowing bubbles. After more than a year of trying—grabbing the bubble wand and sticking it in his mouth, yelling “phew!” but barely aspirating, and so forth—Martin has mastered the art of blowing soap bubbles. Doesn’t sound like much? A year ago Martin couldn’t pucker; his “kisses” consisted of bumping his wide-open mouth into my cheek. As of last week, he’s combining a solid pucker, ocular focus, and breath control in one task. He even unscrews the bubble container top and holds the wand himself, steady. This is huge. Stepping off the escalator. This relates to our old foe, proprioceptive awareness. As City denizens, we’re on escalators constantly, most often in subway stations. The end of an escalator used to involve me yelling, “Okay, Martin! Now! Now! Step now!”, then holding him up by the arm when he inevitably stumbled. I’m down to chanting softly, “And. Here. We. Go!” as Martin lifts his foot and we step off together. Finding humor. Once upon a time, Martin was upset by anything unexpected. Last week he flipped open the top of his drinking Thermos. Because I had mixed “naturally effervescent” kombucha with the filtered water inside, the beverage rushed up the pop-up straw and squirted Martin’s face. Startled, he looked at me for my reaction. (That’s an achievement in itself.) I laughed; I couldn’t help myself. To my surprise, Martin started laughing, too. Later, on the airplane when we were traveling, Martin asked for an ice cube from the club soda I was drinking. (That’s a no-no for Martin, of course; who knows what kind of water is in an airplane ice cube, which was floating in my aluminum-canned drink. Ugh, and double-ugh. But we live in the real world, and do the best we can with what’s on hand, so he got an ice cube.) I tried to deposit the ice cube into Martin’s mouth but missed and somehow rubbed melting ice all over his face. No tears. More laughter. I capitalized on the ice-cube moment and reminded Martin, “Remember when the kombucha squirted you? Squirt!” The kombucha memory kept the giggles coming. We two managed to crack ourselves up for a good five minutes. Drawing inferences. Because his babysitters are taking summer classes of their own, I’ve been picking Martin up at school more often. In the lobby of his school last week he watched me read his teacher-correspondence notebook and peek inside his lunch container. He said, “I ate all my lunch.” Which means: He got it. Martin inferred that I was opening the lunch container to check for leftovers, he recalled his own lunchtime performance, and he provided me relevant information. Expressing emotion. This is just, just starting to happen. Martin talks a lot about falling in a pool, which refers to an event that occurred some months ago at my parents’ home. I’ve heard the story a million times, but last week Martin added a new detail: “When I fell in the pool, I was scared.” Two weeks ago Martin visited Adrian’s office. 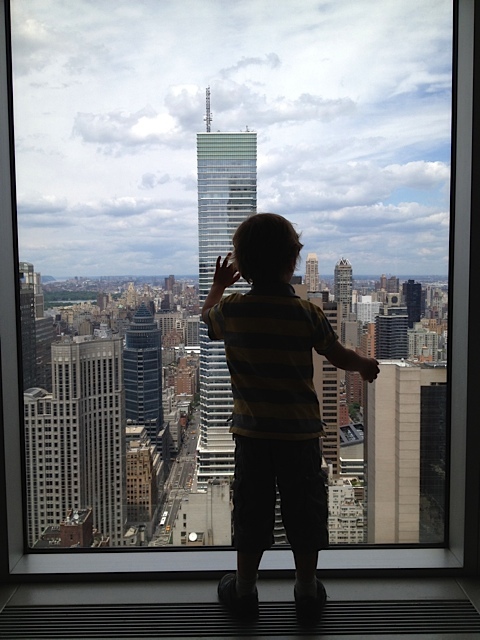 He ran from conference room to conference room, peering through windows at the tops of skyscrapers, then declared, “I am happy.” Finally, we had a guest musician at church, who played guitar and sang an original song. Martin told me afterwards, “I liked the guitar player at church.” These were the first times I’ve heard Martin make original expressions of emotion. Yes, something is different. And I am happy. Martin takes in the City.